Begin with Opening A (fig. 1, Step 1). With your mouth reach over all the strings and return with the far little finger string (Step 2). With your right index reach over the right mouth string, pick up the left mouth string and return (Step 3). With your left index pick up the right mouth string and return (Step 4). Release the mouth loop and the loop on each thumb and extend (Step 5). You now have the Ten Men Loom. The upper and lower near index strings should run directly from hand to hand without crossing. These two strings will become the frame lines of the finished pattern. With each thumb reach under both index loops, pick up the near little finger string, and return (Step 6). This step constitutes the FIRST PART OF THE WEAVE. With each thumb pick up the upper near index string, keeping it above the loop already on the thumb (Step 7). Navaho the thumb loops (Step 8). On each hand release the upper index loop and extend (Step 9). 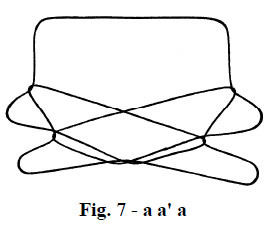 On each hand transfer the thumb loop to the index finger (without inverting or twisting the loop), keeping the transferred loop above the loop already on each index (Step 10). With each thumb reach under both index loops, pick up the near little finger string, and return (Step 11). With each thumb pick up the upper near index string, keeping it above the loop already on the thumb (Step 12). Navaho the thumb loops (Step 13). With each middle finger reach over the upper far index string and pick up the (lower) near index string. Release the little finger loops and extend with palms facing away from you (Step 14). 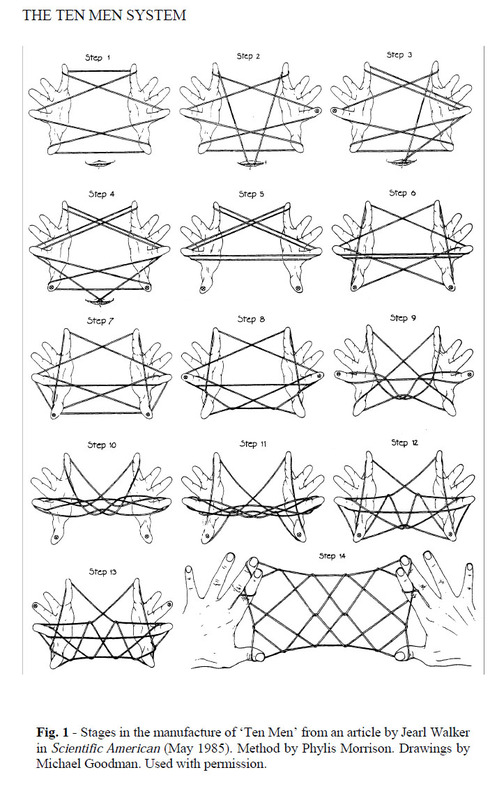 When extended you should have a web or net formed between your hands with ten X’s in it. Each of these X’s represents a man doing a side-straddle hop exercise and that is the derivation of the name Ten Men. Instruct your students to practice this figure until they have memorized how to form it. It is the heart of the system i am proposing. As the students practice making the figure, i emphasize the division of the sequence into phases (setting up the loom, weaving, resetting the loom, weaving again, and extending). The reason for this division is to introduce the concept of systematically altering each phase — a technique which leads to an almost infinite series of different designs. Now comes a new imaginative difference which leads to a real mystery. Suppose you didn’t pick up the near little finger string with the thumb in the regular way but instead “downflipped” it by placing your thumb on top of the near little finger string and curling your thumb down and toward you as you returned (fig. 5). The resulting thumb loops now have a half twist in them (fig. 6). This weave i call a’ (a-prime). 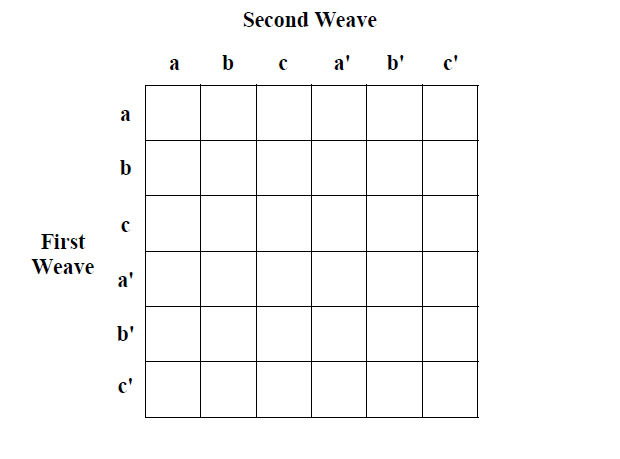 That is because it is the reciprocal or inverse of the a weave. Take special note of the row beginning with a’. 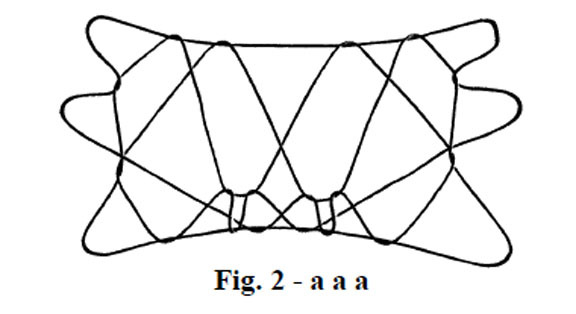 For each figure in this row an incomplete design results (nothing encircles the upper frame string) since the first and second weaves cancel each other (i.e., weaving a a’ a is the same as weaving only a — see fig. 7). You should also note that you will have to find a method of “downflipping” the c weave artificially. The thumb can’t curl down, toward you, and back up without also picking up the near little finger string along with the far little finger string. Therefore, you will need to practice pulling a c weave and then adjusting the loop on each thumb to create what would have been a downflip of the c weave if it had been physically possible. Perhaps the easiest way is to simply lift the new loop off each thumb, rotate the loop half a turn away from you, reset the loop on the thumb, then finish the weave (i.e., pick up the upper near index string and navaho thumbs). There is also a method of flipping the string which is not as natural, but which must be thought of in order to round out the possible differences in our weaving patterns. In the inverse weaves described above, we artificially formed the “downflip” of the c weave by rotating the new thumb loop half a turn away and then resetting it. The anti-inverse would be formed by rotating the new loop half a turn towards you (fig. 8). Finishing the weave would then result in a running half-hitch in the figure. And obviously all the weaves described so far will have an inverse and an anti-inverse (a prime and a double prime in my notational system). 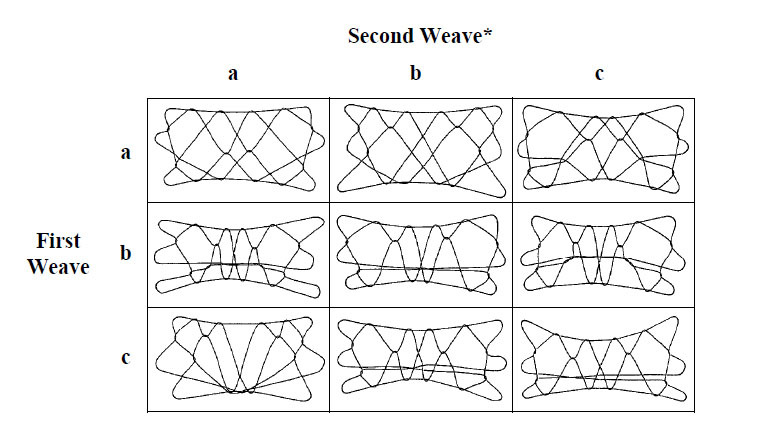 However, i haven’t found any real use for anti-inverse weaves except for introducing a half-hitch into the design.